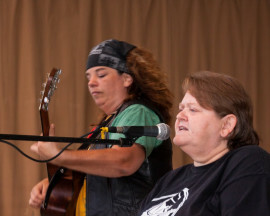 Katey Day is an accomplished musician, playing guitar, mandolin, bass, drums, and harmonica. Regardless of what she picks up, the results are always spellbinding. Katey’s songwriting skills are also well established, crafting of works of ironic humour and heartfelt emotion that never fail to strike home with her audience. Drawing on influences from all musical genres, Katey has the unique ability to take any song and make it her own, putting an indelible stamp on all who come within earshot of her rich, powerful voice. She truly is a powerhouse performer. Sponsored by Pat McGowan & Dennis Carter.